It’s the buttermilk batter that gives this chicken its crunchy texture. Make sure you shake off any excess batter before frying. After the chicken is in the hot oil, grandmother would a lid on her pan to ensure the meat inside gets cooked, while leaving the outside crispy. In a shallow bowl or pan, combine the flour, salt, and pepper. Dredge each chicken piece in the seasoned flour to coat well. Heat about 1-inch of the vegetable oil in a cast iron skillet or Dutch oven until it reads 350°F on a candy thermometer. Place a few pieces of the chicken in the oil being careful not to crowd them. Fry for 6 to 8 minutes. Turn the pieces over, then cover the pan to cook for an additional 6 to 8 minutes. Drain on paper towels and salt well. 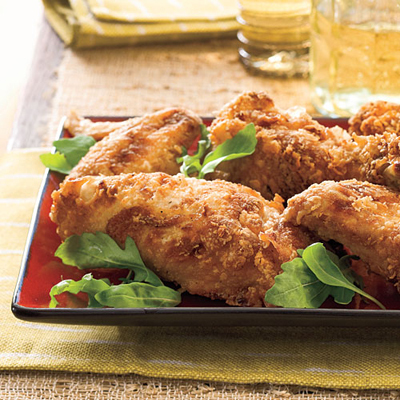 Recipe adapted from My Grandma’s Fried Chicken, in the cookbook My Family Table by John Besh.